The impacts of a changing climate are already evident in Canada and globally. Adapting to the changing climate is necessary to deal with the effects of these changes. Adaptation involves adjusting our decisions, activities and thinking because of observed or expected changes in climate, with the goals of moderating harm and taking advantage of new opportunities. 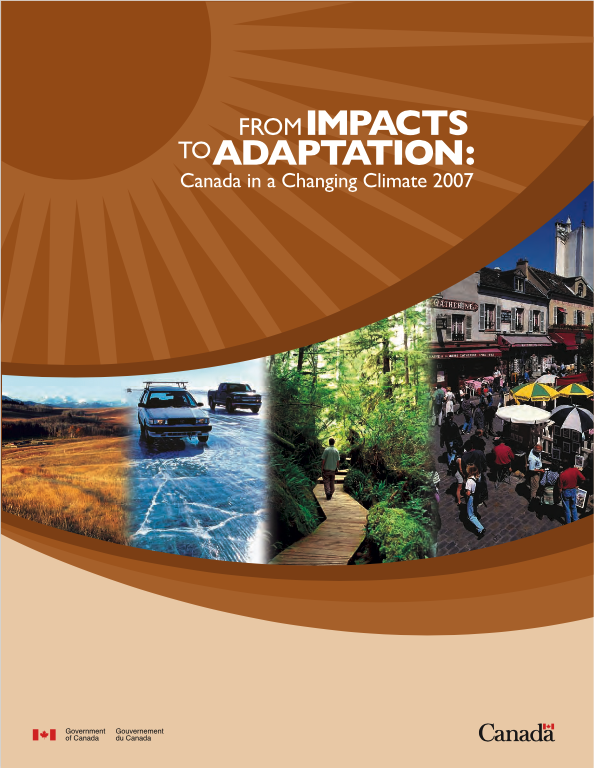 "From Impacts to Adaptation: Canada in a Changing Climate 2007" reflects the advances made in understanding Canada’s vulnerability to climate change during the decade previous to 2007. Through a primarily regional approach, this assessment discusses current and future risks and opportunities that climate change presents to Canada, with a focus on human and managed systems. It is based on a critical analysis of existing knowledge, drawn from the published scientific and technical literature and from expert knowledge. The current state of understanding is presented, and key knowledge gaps are identified. Advances in understanding adaptation, as well as examples of adaptation initiatives are highlighted throughout the report. The report includes a chapter on background information, six regional chapters (Chapter 3: Northern Canada, Chapter 4: Atlantic Canada, Chapter 5: Quebec, Chapter 6: Ontario, Chapter 7: Prairies and Chapter 8: British Columbia), Chapter 9 looks at Canada in an international context and Chapter 10 focuses on moving forward on adaptation. Case studies are used throughout the report to highlight advances in adaptation. Download the full text from the right-hand column. The impacts of changing climate are already evident in every region of Canada. Climate change will exacerbate many current climate risks, and present new risks and opportunities, with significant implications for communities, infrastructure and ecosystem. Climate change impacts elsewhere in the world, and adaptation measures taken to address these, will affect Canadian consumers, the competitiveness of some Canadian industries, and the Canadian activities related to international development, aid and peacekeeping. Impacts of recent extreme weather events highlight the vulnerability of Canadian communities and critical infrastructure to climate change. Adaptive capacity in Canada is generally high, but is unevenly distributed between and within regions and populations. Resource-dependent and Aboriginal communities are particularly vulnerable to climate changes. This vulnerability is magnified in the Arctic. Integrating climate change into existing planning process, often using risk management methods, is an effective approach to adaptation. Barriers to adaptation action need to be addressed, including limitations in awareness and availability of information and decision-support tools. Although further research will help to address specific knowledge gaps and adaptation planning needs, we have the knowledge necessary to start undertaking adaptation activities in most situations now. Current levels of exposure and sensitivity to climate-related changes, as well as limitations in adaptive capacity, make some northern systems and populations particularly vulnerable to the impacts of climate change. Climate-induced changes in permafrost, sea ice, lake ice and snow cover have large implications for infrastructure maintenance and design. Climate changes will result in shifts in species availability, accessibility and quality, with consequences for biodiversity and human populations that rely on these resources. Increased navigability of Arctic marine waters and expansion of land-based transportation networks will bring both opportunities for growth in a range of economic sectors and challenges associated with culture, security and the environment. Maintaining and protecting aspects of traditional and subsistence ways of life in many Arctic Aboriginal communities will become more difficult in a changing climate. Changing climate will result in more storm events, increasing storm intensity, rising sea level, higher storm surges, and more coastal erosion and flooding, affecting coastal communities and their infrastructure and industries. Water resources will come under increasing pressure as conditions shift and demands change in response to both climatic and non-climatic factors. Impacts on marine fisheries will extend beyond fish species to include numerous aspects of fishery operations, such as transportation, marketing, occupational health and safety and community health and well-being. Although high temperatures and longer growing seasons could benefit agriculture and forestry, associated increases in disturbances and moisture stress pose concerns. Vulnerability of Atlantic communities can be reduced through careful planning, especially in coastal regions and through adaptation focused on limiting exposure to sea-level rise. The largest changes in climate in this region are anticipated to occur in Northern Quebec, exacerbating existing problems relating to natural disasters and critical infrastructure, and challenges in maintain traditional ways of life. Climate change impacts on the natural environment will adversely affect ecosystem health, and have especially significant consequences where natural resources are a key component of the economy. Some impacts could be beneficial for certain economic sectors, including hydroelectricity and forestry. In the Maritime region, there will likely be increased shoreline erosion along the Gulf of St. Lawrence and the St. Lawrence River estuary, where most of the region’s social and economic activity is concentrated. In southern Quebec, an increase in frequency, intensity or duration of extreme weather conditions would increase risks for the aging built environment, vulnerable populations and communities in the areas exposed to natural hazards. Adaptation offers many possible solutions for reducing adverse impacts. Quebec’s increasingly diversified knowledge economy provides a high degree of adaptive capacity. Little is generally known about the costs and limitations of adaptation, particularly in the long term. Climate-related disruptions to critical infrastructure, including water treatment and distribution systems, energy generation and transmission, and transportation have occurred throughout the province and are likely to become increasingly frequent in the future. Water shortages have been documented in southern regions of the province, and are projected to become more frequent as summer temperatures and evaporation rates increase. Climate-related events, such as extreme weather, heat waves, smog episodes and ecological changes that support the spread of vector-borne diseases, all present risks to the health of Ontario residents. Remote and resource-based communities have been severely affected by climate-related events that have caused repeated evacuations, disrupted vital transportation links and stressed forest-based economies. The impacts are expected to increase in the future. Ontario’s ecosystems are currently stressed by the combined influence of changing climate, human activities and natural disturbances. Ontario has a strong capacity to adapt to climate change; however, this capacity is not uniform across the region and between sectors. Increases in water scarcity represent the most serious climate risk in the Prairie provinces. Ecosystems will be impacted by shifts in bioclimate, changes in fire and insect disturbances, stressed aquatic habits and the introduction of non-native species, with implications for livelihoods and economies dependent on ecological services. The Prairies are losing some advantages of cold winter. Cold winters limit pests and diseases, facilitate winter operations in the forestry and energy sectors, and provide access to remote communities through the use of winter roads. Communities dependent on agriculture and forestry are highly sensitive to climate variability and extremes. Drought, which can have associated economic impacts of billions of dollars, wildfire and severe floods are projected to occur more frequently in the future. Adaptive capacity, though high, is unevenly distributed, resulting in differing levels of vulnerability within the region. Although adaptation processes are not well understood, institutions and civil society will play a key role in mobilizing adaptive capacity by building on several recent initiatives that enhance resilience. Many regions and sectors of British Columbia will experience increasing water shortages and increasing competition among water uses (for example, hydroelectricity, irrigation, communities, recreation and in-stream flow needs), with implications for transborder agreements. Extreme weather and related natural hazards have impacted, and will continue to impact, critical infrastructure, affecting communities, industries and the environment. British Columbia’s forests, forest industry and forest-dependent communities are particularly vulnerable to climate-related risks, including pest infestation and fire. Climate change will continue to exacerbate existing stresses on British Columbia’s fisheries. The vulnerability of Pacific salmon fisheries is heightened by the unique social, economic and ecological significance of these species. British Columbia’s agricultural sector is facing both positive and negative impacts from climate change, with more frequent and sustained drought being the greatest risk. Integrating climate change adaptation into decision-making is an opportunity to enhance resilience and reduce the long-term costs and impacts of climate change. Climate change is already affecting the residents, economies and environments of all regions of the world. These impacts, which are primarily related to extreme climate events and changes in water resources, are mostly adverse and are expected to continue and intensify in the future. Diseases currently prevalent in warmer climates will become greater threats in Canada as a result or greater incidences of disease and vectors in countries that are involved in trade and travel with Canada. The impacts of climate change and the adaptation measures that other countries take to respond to them can affect Canada in a number of ways, with potentially significant implications for competitiveness, health, tourism, disaster relief, development aid and peacekeeping. As a developed country, Canada will face increasing demands to support disaster relief efforts and to help developing countries adapt to climate change. Lemmen, D.S., Warren, F.J., Lacroix, J., and Bush, E., editors (2008): From Impacts to Adaptation: Canada in a Changing Climate 2007; Government of Canada, Ottawa, ON, 448p.